The wifely friend is driven. She has near-term and long-term goals. She has a planner. She knows what Franklin-Covey is. I thought it was a Peanuts character. She has goals like "become an executive by 35" or "save money". And--this is the amazing thing--she actually does them. For me, goals are a little less impressive. For a long time they were along the lines of "eat the biggest sandwich possible", "try not to sleep past noon more than three days a week" or "juggle". One goal I've always had, though, was very simple: "own a pinball machine". It's not the most ambitious goal, and it sure isn't the most sensible one. No job interview is going to swing your way because, "Sure, boss. The other guy was valedictorian at MIT, but this guy has his own pinball machine. I bet if we hire him we get to play!" No supermodel ever dated a guy solely because he had a Twilight Zone machine in his basement. There are only about four pinball machines I've really wanted to own, and they're all Williams machines. Williams made the best machines, and abruptly stopped making them in the 90s, when pinball just couldn't compete with video games any more. They turned to making lucrative slot machines instead. The four machines I wanted were: High Speed, Earthshaker!, Black Knight 2000, and Indiana Jones. For years I'd talked about getting a machine, but I felt like it was a little selfish. I mean here is this giant machine that's going to take up space in the garage, cost a fair bit of money, and monopolize a lot of my time. Every year, I'd go to California Extreme, which is a pinball and video game show in San Jose, play eight to ten hours of pinball, and come back all revved up to get a machine. Months would pass, and I'd let my goal drift away. But after this year's show, the wifely friend said "Jeez, will you just buy one already?!" And so I did. 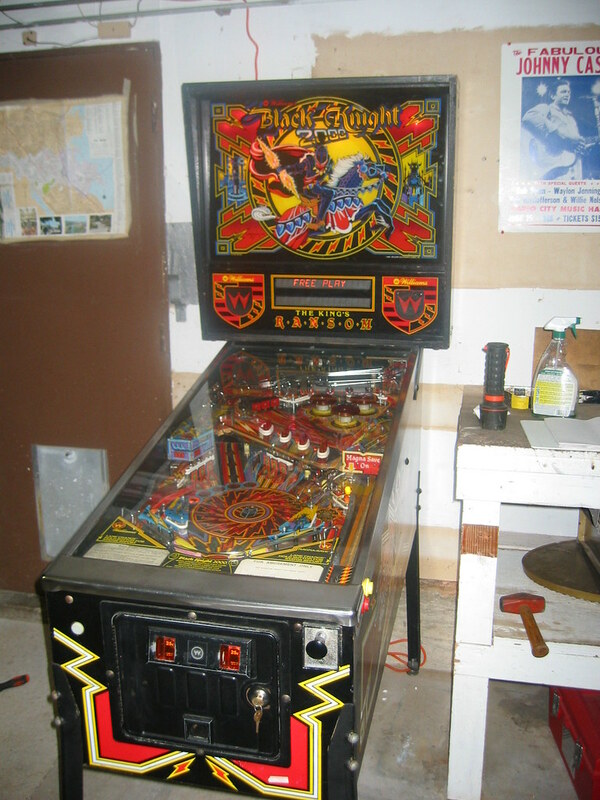 I won an auction on eBay for a Black Knight 2000 machine. It needs a little bit of work, like replacement of the lower display for player 3 and 4 scores, but it plays great. My good friend Chimmychanga helped me pick the thing up and drive it back home. Even brought along his reciprocating saw and helped me carve my workbench in half to make room for it in the garage. Actually, he did most of the work. But now I've finally got a pinball machine. Reaching a goal, you cant beat it. Did anyone watch the premiere of Pirate Master last night? I'd like to pretend I'm above that sort of thing, but I admit to you freely, I watched almost half of it. It was so terrifyingly poor that I don't know if I could stomach another episode. It's even less interesting than Survivor...on Pirate Master, a bunch of tools in eyeliner sit around with nothing to do in between curiously uninvolving challenges wherein they have to do things like row boats around papier-mache skeletons. At the end of the season, one person will be left and will get his or her hand chopped off and replaced by a hook or something. I don't know. The show's producers are obviously aware it's a little tedious, and so put in some stringent rules about the women on the show needing to wear very revealing tops at all times. Good thinking, there. One of the eyeliner-wearing would-be pirates gets voted as captain of the ship, and immediately sets about being super-annoying by talking in a pirate voice, and taking things seriously despite the fact that everyone is clearly just this side of giggling. In the voting at the end, the pirate crew can vote off one of the captain's nominees, or declare a mutiny, in which case the captain is kicked off. It all seems needlessly complicated. Not to spoil it for you, but the most enjoyable contestant was kicked off in the first episode. I only caught the second half, but every time they showed him, his tagline was Scientist/Exotic Dancer, which I guess is kind of like Fighter/Magic-User without the magic missiles. I picture him straining over a microscope, struggling to isolate that elusive strain of euglena that explains everything. Enraged, he sweeps the microscope aside and shakes his fist at the uncaring nature of the universe: "If only I could prove to these fools that their methods are unsound! I ... I.... I gotta dance!" "Strokin'" starts up on the tinny speakers of the lab as scientist/exotic dancer gyrates in a revolving petri dish, pulling off his chemical-spattered smock. Middle aged women rush at him, but he holds them at bay, in awe of his equations. If only I could have Scientist/Exotic Dancer on my business card! PS if you must, check out his ridiculous website, where you can learn annoying things like the fact that his dog is named Machiavelli.